Gary and Helen Ivory have made a magnificent job of refurbishment to our local pub, The Old Red Lion Great Brickill . 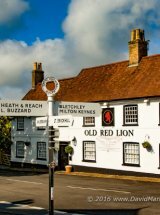 The couple are determined to support the local community by increasing the function of the pub beyond the traditional fare of drinks and meals. They hope to open for morning coffee and afternoon tea. They already support local art with displays of paintings. The pub staged a grand re-opening on Friday 27th May 2016. It was a glorious sunny evening, which along with the free Proseco and canapés helped to attract over 120 people. Mike Turner was first through the door at 6pm and was rapidly followed by a queuing band of local admirers of the pub. It was good to see so many local people there and some who had come from further afield. Can't wait to sample the new menu which the new team start serving on the 28th. Good luck on the enterprise Gary and Helen; fabulous start!